Safety in Agriculture for Youth - grant project funded by the US Department of Agriculture (USDA), National Institute for Food and Agriculture to develop a sustainable and accessible national clearinghouse for agricultural safety and health curriculum for youth. eXtension - Ag Safety and Health Resources - This is a comprehensive collection from the Farm & Ranch eXtension in Safety and Health (FReSH) Community of Practice (CoP) is a collaborative effort between universities, industry, and government to provide user-friendly information for the general rural population, agricultural producers, and agricultural safety and health professionals. 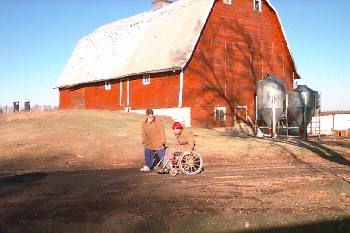 Financial support for this project is provided by the United State Department of Agriculture, National Institute of Food and Agriculture; eXtension; and CHS Inc.
National AgrAbility Project - On this site, learn how to get assistance if you're in need of AgrAbility services, and explore the possibility of starting an AgrAbility Project, if one doesn't already exist. For people in WISCONSIN, go to the AgrAbility in Wisconsin site!